Pinguin BOBO's KINDER-CLUB® is a ski school for children and young people aged from 3 to 13 years old. 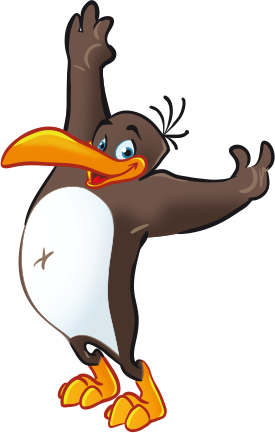 Activities revolve around BOBO the Penguin, who is not simply a mascot but first and foremost a good friend to have out on the piste. BOBO the Penguin helps the ski instructors do their job and shows parents and children that skiing can be real fun, turning ski holidays with children into a special experience. Every year, around 150.000 children attend our Pinguin BOBO's KINDER-CLUB®. Here you can find great stories as audio books and penguin BOBO's song for you to sing along at the top of your voice and dance to. Try out your skiing abilities with our online game featuring BOBO the penguin! Click here to see the KINDER-CLUBS© in Austria, Germany and Switzerland. Can I register for a skiing course online? YES! See for yourself whether you're a beginner, advanced skier or professional. Skiing in a group is a lot of fun, but only if it's not too difficult and not too easy. And who wants to spend their time in the ski school office or on the grading slope instead of on the piste? As a small aid for use at home, we have made short grading films for all children and parents. Now you can see what you have already learnt and practised, and select the group that suits you best. Then you're free to enjoy the pistes.